We stayed at Le Meridien, close to the airport in Tahiti for 4 days at the beginning of our trip and two at the end. 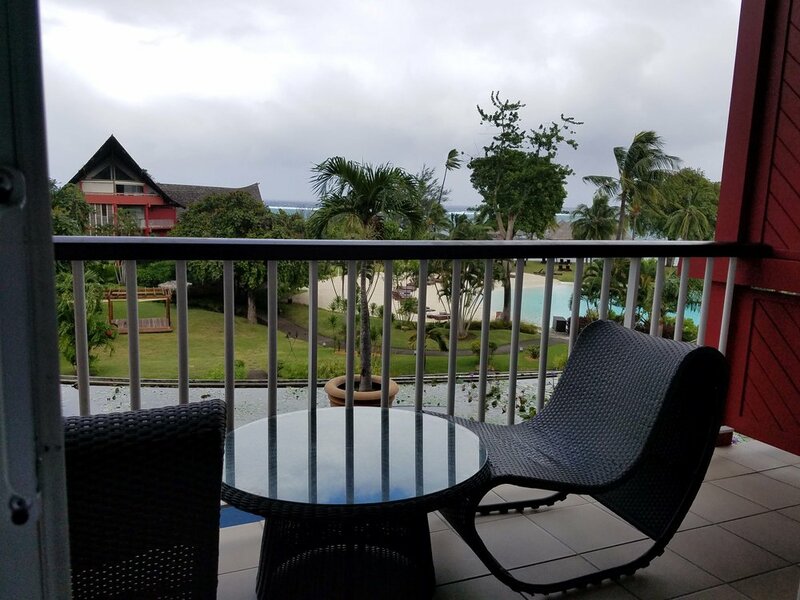 It was well located on a lovely bay with a view of Moorea and close to the airport. We arrived early, on a red-eye from LAX, and it was very easy to check in. They, of course, did not have our rooms ready but we were able to use the transit room – not something I would recommend. The room felt like a flop house with several couches and chairs and 3 less that acceptable showers. It smelled moldy and was not a great first impression. The first morning the weather was rainy and very windy so our plan to lay by the pool was spoiled and the transit room was not an option, except to shower off quickly. The lounge, grounds and restaurants are lovely, open with expansive views of the bay out to the front and the mountains in the back. 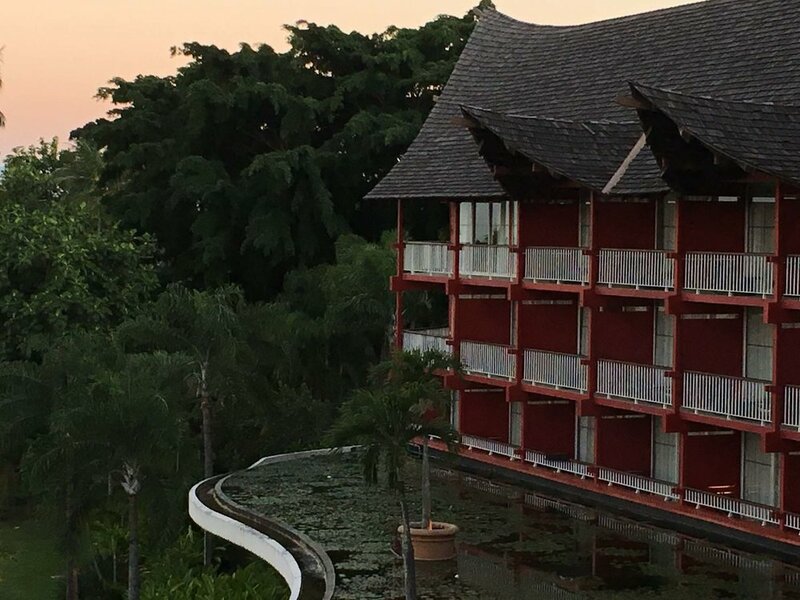 They have a lovely coy-stocked lily pond in front of the restaurant where buffet breakfast and dinner are served, and another almost identical up on the lounge level. We had read about an art gallery that is located on the top level of the hotel but it was never open when we went to look, watch carefully for hours. There is also a small gift shop that has limited hours. The wifi was best in the lobby so we chose to relax there and catch up on what was going on in the world before we disconnected for most of 3 weeks. The over the water bungalows were closed for repairs but looked nice and made for a very Polynesian view. The gardens are well kept and very lush and they have a sand-bottom pool that is huge! 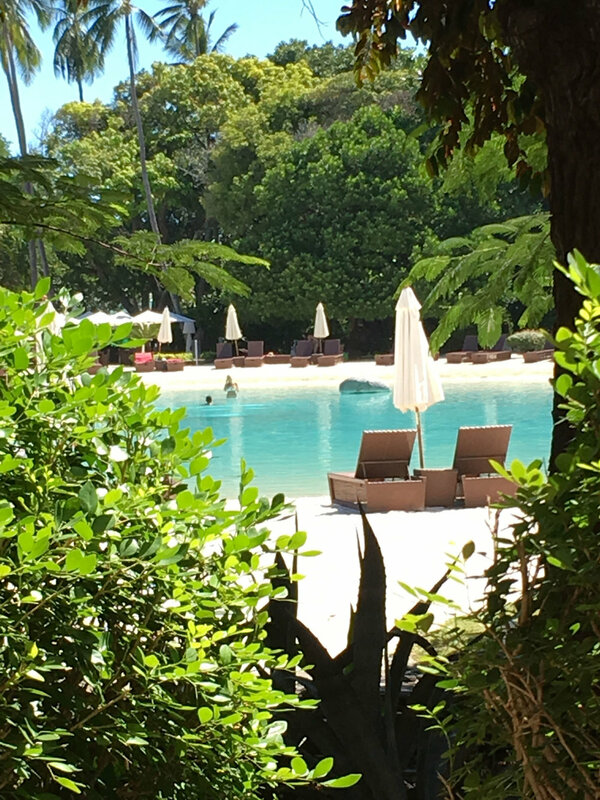 We loved using that during our stay, it was perfect for lap swimming even with others in it – no lap lanes in the sand, you actually swim between fake rocks. We felt it was one of the best pools in the world. The sandy bottom didn’t deter from the cleanliness of the filtered, chlorinated fresh water. As the morning went on the weather started to clear and we headed for lunch by the pool. The food options at Le Meridien are Le Carré Restaurant, La Plantation Restaurant, L'Astrolabe Bar and Le Pool Bar. The Plantation is open for a buffet breakfast and buffet dinner. It closes during the day. L’Astrolabe Bar is a lovely bar on the mezzanine level between the hotel lobby and The Plantation and is open late afterno on. Le Carre Restaurant is open for lunch and dinner and is overlooking the beach with a view toward Moorea had has both indoor and outdoor seating. The Pool Bar is located next to the sandy-bottom pool and has a more limited menu. The service at the Pool Bar seemed to be slow, but what the heck you are on vacation in paradise. We ate here a few times and enjoyed it for its convenience, more than the food and service. Le Carre is a lovely restaurant with wonderful food but inconsistent. The Plantation had the best service and the food was what you would expect for a buffet breakfast. The issue was that it came with 3 price options that were a little confusing and not always adhered to. It was a lovely setting to start our day so we had no complaints. 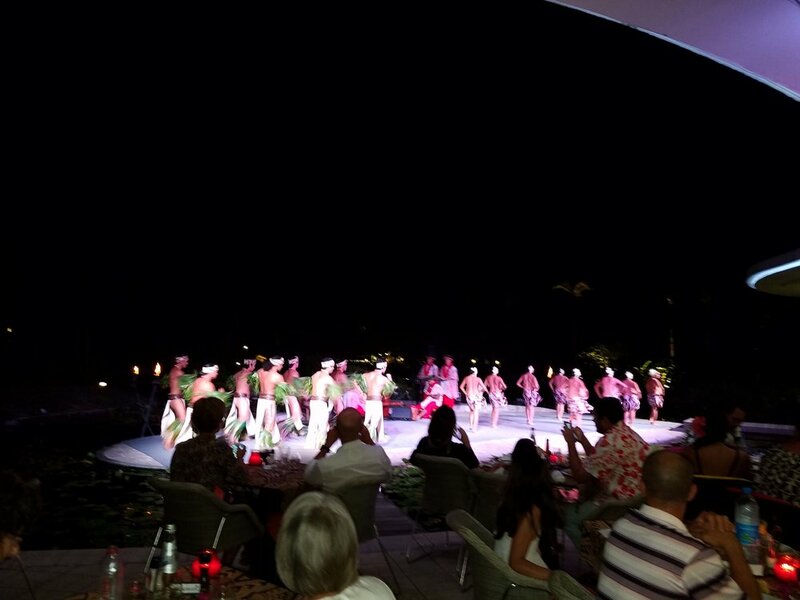 Our last night we ate at The Plantation to see the Polynesian dance show. We were very disappointed in the food. The show was beautiful but seems touristy and more show-biz than a traditional show. The bedrooms were extremely clean, and we were unexpectedly pleased. After seeing the transit room and that the over-the-water bungalows were in disrepair, we didn’t know what to expect. But our rooms were great both before and after our cruise. 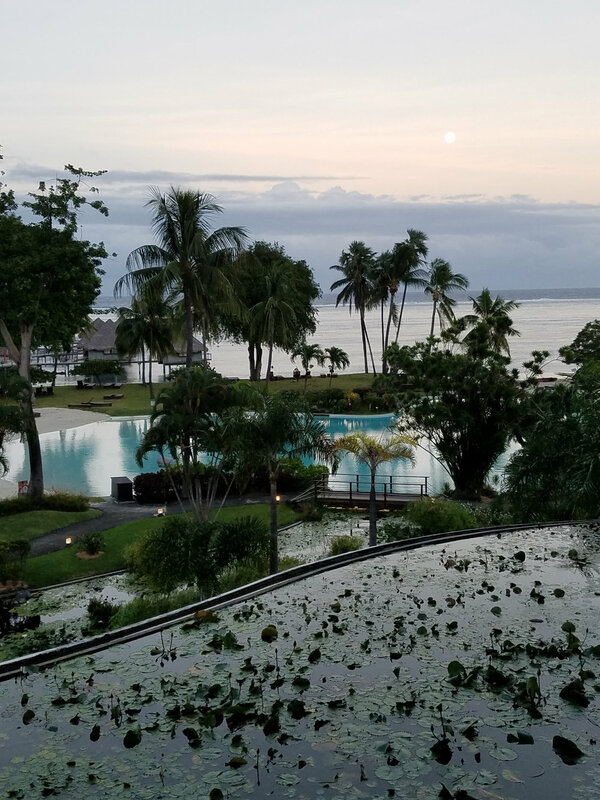 There were on opposite sides of the property and we found them equal in quality – one with a view of the lagoon, the other with an ocean view with Moorea rising in the distance. The small details, when it comes to a hotel room, are always important and their linens and bath products were lovely. There was wifi, but it was not as strong as in the lobby. The balcony was very nice, except for the chairs, which were low-to-the-ground rockers that my husband could not use. A comfy chair to enjoy the views would have been nice. Another plus is that the hotel is within walking distance to the Museum of Tahiti and its Islands. A very lovely, small museum located on a gorgeous park on the water with an amazing view. It has artifacts and relics from throughout Tahiti’s history, a lovely garden that lets you know the name of all the flora.In addition, we were lucky enough to be there for a photography exhibit which was worth the extra cost. 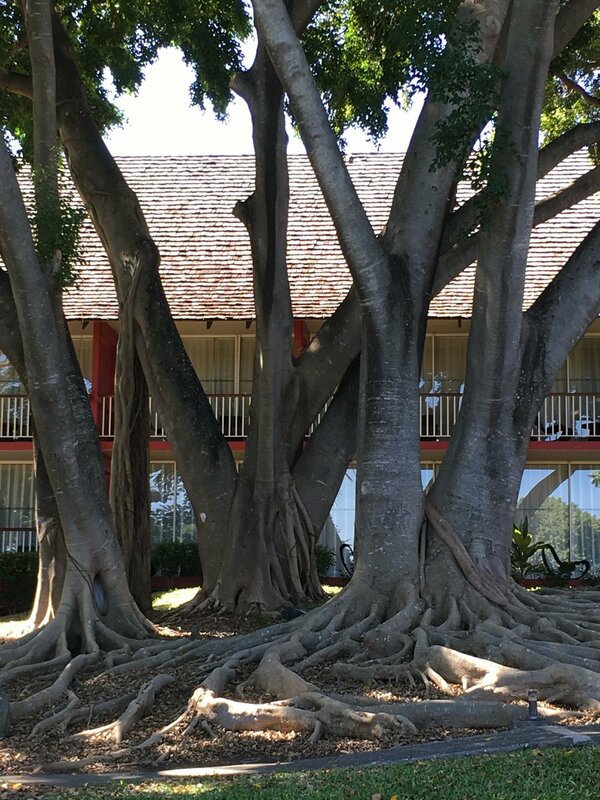 The staff at Le Meridien were excellent they provided great service and were more than willing to help with any question or need we had from recommendations to arranging transportation or setting up a tour. Our last day in Tahiti was thanks to Air France and the firemen of Tahiti, who were on strike. Our flight was delayed by 24 hours and Air France picked up our tab for our room and meals. The concierge was so kind. She made arrangements for us to tour the entire island in the afternoon and when I explained to her that I came all the way to Tahiti in hopes to see Spinner Dolphins, but that they evaded me at every stop, she made a phone call and arranged for us to go out on an inflatable with our own guide to experience the dolphins in the wild that morning. What an ending to an amazing trip.